Cancun and the Riviera Maya are renowned for their tropical plants and exotic animals. Tourists from across the globe come here to witness their unique and unusual wildlife. It’s your turn to come visit some of our most amazing creatures. They are right here waiting for you; take a sneak peak! The hallmark of the Riviera Maya is undoubtedly the Toucan! 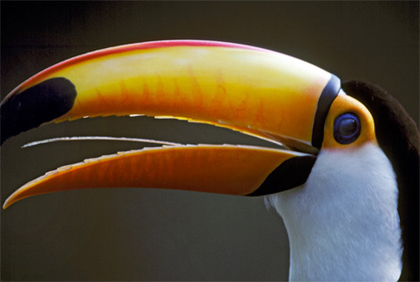 Toucans are tropical birds famous for their big beaks. The latter not only regulate the birds’ temperature, but they are useful for reaching fruit on branches that are too small to support their weight. Toucans are considered to be one of the noisiest jungle birds, with a croak that can be heard a mile away! There are very few places in the world where you can actually see or even swim with Manatees, and Cancun is one of them! Manatees are aquatic mammals, also known as as “sea cows” because of their completely vegetarian diet (and not because of their physical appearance)! With an upper lip that resembles an elephant’s short trunk, they are an absolute must-see! These 500-pound creatures are genuinely friendly and extremely smart. Sea Turtles are one of the most fascinating marine creatures in the Riviera Maya. Having lived over 100 million years, they were considered to be a sacred animal for the Mayas. Akumal, (“turtles” in Mayan), is home to many sea turtles and is a great location for diving and snorkeling. Sea turtles are now considered endangered species and are protected under Mexican Federal Law. The Tapirs of Central America are one of the four species of Tapir that exist worldwide.They are approximately 7 feet long, have a stout body and large head. Since Tapirs have a very low reproductive rate, their population is severely affected. In Mexico, only three zoos have a conservation program for Tapirs, Xcaret being one of them. Spider monkeys are widespread in the Yucatan region. These amusing primates are very witty and active. They have unusually long limbs, hence the name “spider”. You will find them mostly in large jungle forests. They communicate using postures, and when they see a human approaching, they “bark” loudly, similar to a small dog. Flamingos are very social birds: they usually live in group communities to protect themselves from environmental threats.Their pink bodies, curved beaks, and pronounced necks make them one of the most interesting and amazing creatures in the Riviera Maya!